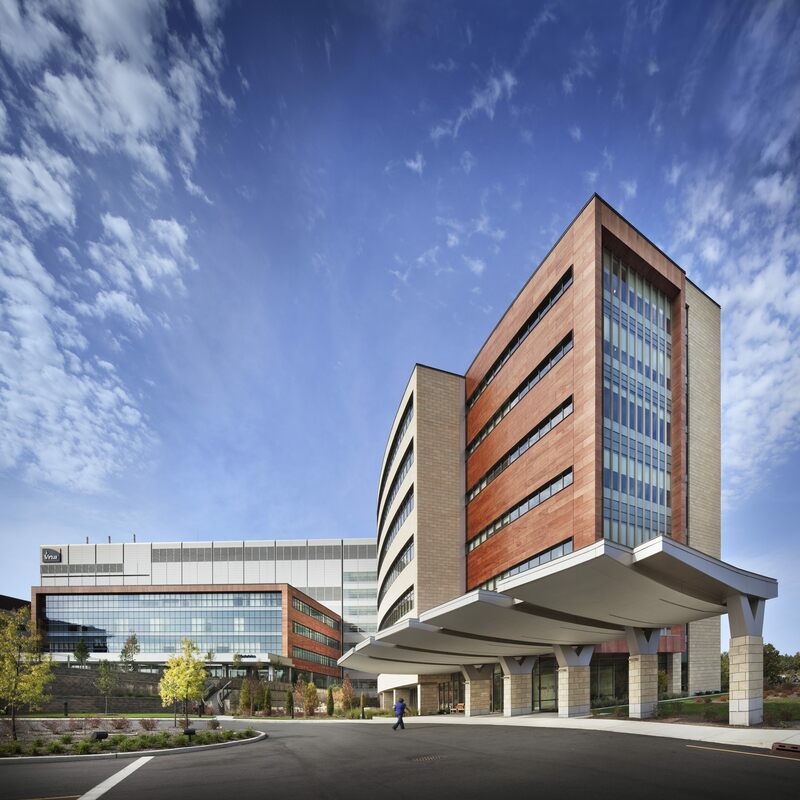 Responding to Virtua Health’s commitment to quality service in Southern Jersey, Virtua Voorhees Hospital promotes patient care through advanced technologies and streamlined workflows while integrating the region’s natural elements and wooded landscape into a healing environment. HGA initiated an interactive design process that builds on Virtua’s long-standing commitment to Six Sigma, Lean processes and digital technology to enhance healthcare delivery. The team worked with Virtua leadership, staff, user groups and GE Healthcare Technologies to map current work processes using photo journaling, current-state process mapping, future-state operational models, and technology assessment. From this data, the team identified “gaps” in the workflows to propose the ideal future work processes for optimal patient care. The team organized the 125-acre campus around separate entries, with the site’s south half dedicated to the Ambulatory Care Center and Medical Offices Buildings and the site’s north half dedicated to the inpatient hospital, with a greenway providing a natural buffer between the two halves. The curving hospital embraces the landscaped campus, taking architectural cues from southern New Jersey’s historic buildings. Exterior detailing feature energy-efficient glass, maintenance-free wood panels, and manufactured stone panels reminiscent of regional New Jersey stone. Exterior materials carry into the interior, reinforcing a holistic feeling where the expansive windows usher natural light into the waiting areas, corridors and patient rooms and visually connect to the exterior. Color palettes complement the natural hues and tones found on site, enhancing the calm, safe feelings crucial in a healing environment. Other design features include private patient rooms with family space and homelike aesthetic, decentralized nurses’ stations to streamline work processes, digital technology to improve access to medical records, and clear wayfinding and signage to direct patients and visitors through buildings. Our high-touch patient care is what people know us for. We wanted this facility to bring that out and make sure that when the community comes in, they feel the caring culture that we have here as an organization. HGA built that into the facility very well.